The southbound lanes of Interstate 95 will reopen Sunday night after a leaning Potomac Mills Mall sign led to a days-long closure. 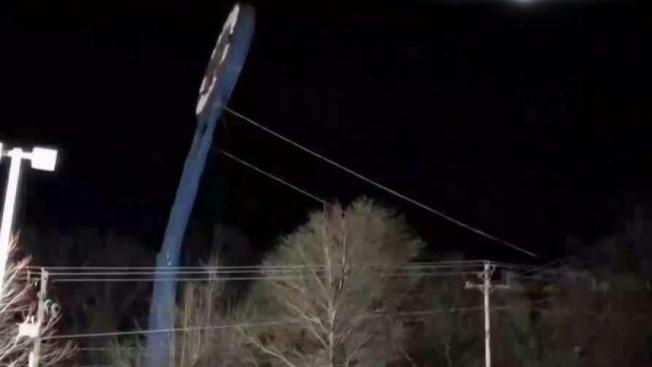 Forceful 60 to 70 mph wind gusts caused the 140-foot sign in Woodbridge, Virginia, to tilt forward Friday. Structural engineers inspected the sign and found that it posed a significant threat to the area, Prince William County officials said online. The Virginia Department of Transportation shut down the southbound lanes of I-95 at Prince William Parkway for fear that the sign would come down. Tolls were suspended on I-95 South Express Lanes over the weekend. VDOT warned drivers Sunday night to avoid traveling on I-95 in Prince William County on Monday if the sign wasn't taken down by then and advised them to take alternate routes, carpool, take public transportation or telework. 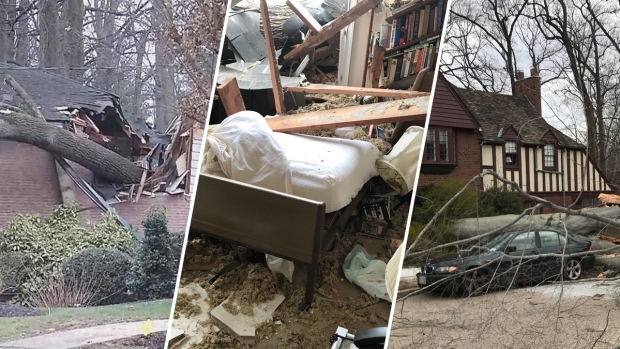 While Sunday's blustery winds were nowhere near the strength of those that damaged trees, homes and cars throughout the region on Friday, the winds were still strong enough to prevent crews from fixing the sign, officials said. Prince William County officials said earlier Sunday night that the Potomac Mills Mall was responsible for removing the sign. "Potomac Mills Mall property owners noted that they will not attempt to remove the sign until winds die down enough to allow safe removal. They are hopeful that they will be able to remove the sign before the Monday commute, but it is unclear whether that will be able to occur. Should Potomac Mills fail to remove the sign by Monday morning, commuters should expect significant traffic delays," read a statement on the Prince William County government website.